The Historic Town of Sukhotai and Associated Historic Towns was the capital of the first Kingdom of Siam. It illustrates the beginnings of Thai architecture. 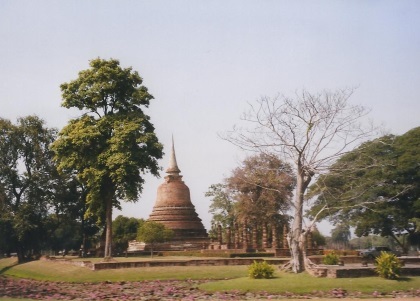 Sukhothai blossomed in the 13th and 14th centuries. It was built by the Khmers and taken over by the Thais in 1230. The Thai language and alphabet originated here, the last was invented in 1283 by the famous King Ramkhamhaeng as a revision of various forms of Khmer alphabets into a system suitable for the writing of Thai words. The same king made Sukhothai a powerful kingdom which included many parts of what are today neighboring countries. A number of ancient cities paid him tribute. King Ramkhamhaeng also opened direct political relations with China and made two trips to China (the first in 1282 to visit the Emperor Kublai Khan). 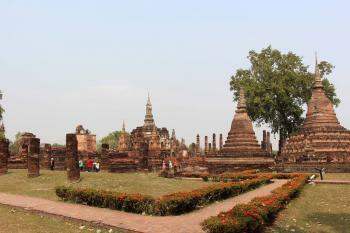 Within the walls of Sukhothai are the ruins of twenty wats (temples) and monuments, the greatest of which is Wat Mahathat. The beauty of water, for example via pools with lotuses, was also used to enhance the spiritual aspect of the wats. The site at Sukhothai is a stylish park, where you can explore the ruins by cycling from one monument to the other. The statues and temples are much better preserved (though several centuries older!) than the ones at Ayuthaya, or is that just my imagination? Sukhothai is on more than 400 kilometers distance from Bangkok. I stayed at nearby city Phitsanulok, and went to Sukhothai by local bus, a good option. I visited this WHS in December 2017. During my long weekend stopover in Bangkok (before heading to Oceania), I managed to fit in a day trip visit to Sukhothai thanks to Philip's precious info regarding the daily flights with Bangkok Airways. By around 08:45 I was already exploring the well kept Sukhothai Historical Park. Bangkok Airways is no longer in charge of the shuttle service but the only car rental agency in the 'airport' provides this service. The departures are timed to coincide with the flights, even though I was quite uneasy to allow only 45 minutes before my 17:45 return flight to Bangkok. Everything worked out fine though and I managed to see quite a lot of the park and allow for some revisits too. The term park here is very appropriate as there are lawns, palm trees, ponds, hedges and flowers separating each complex of wats. In a way it reminded me of my visit to Khajuraho, India. The atmosphere is very serene and bicycles are the main means of transport around, unlike Ayutthaya. I opted to visit on foot but there were longish walks/hikes I could have avoided especially when visiting the western and northern sections. The restoration works of some of the wats is a bit shoddy and it reinforces my conviction that there is no valid reason not to inscribe Myanmar's Bagan in the forseeable future. That said, in my opinion Sukhothai is Thailand's best cultural WHS and still well worth visiting. The central section is obviously the most visited, although there weren't any significant crowds when I visited; just a couple of tour groups racing from one wat to the next to make it in time for lunch (most of the time more than 30 minutes away by car!). 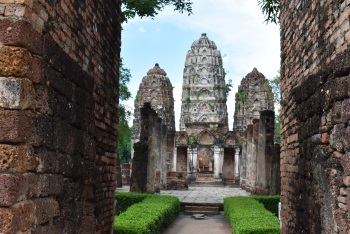 The highlights of the central section were Wat Mahathat, Wat Si Sawat, Wat Sa Si and Wat Tra Phang Ngoen which are all conveniently next to each other, even though quite a lot of walking is involved. The highlight of the Western section was Wat Saphan Hin but I wouldn't venture this far if you're not so fit. I could appreciate the different gate remains and some sections of the walls/enclosures too. The highlights of the Northern section were Wat Si Chum (separate ticket) and Wat Phra Phai Luang. On the way to visiting the Northern section, I really enjoyed the minor temples (especially Wat Sorasak) and the different shrines built in the Khmer style. There is a big UNESCO sign close to the ticket office of the Sukhothai Historical Park but the actual inscription plaque can be found at the associated historical city of Si Satchanalai (same format as the one in Ayutthaya). Unless you're a completionist, the OUV of this WHS can easily be appreciated by visiting Sukhothai only. Like most temples in South East Asia, sunsets and sunrises would be a plus point when staying for at least a night and there's also a sound and light show in the evening but apart from that, there isn't much more on offer in Sukhothai. I went to Sukhothai Historical Park while the wake of the King was still ongoing, hence I was fortunate enough to have visited the sections without having to pay the entrance fees. Sukhothai stands as a more presentable ancient capital -- albeit being the older one -- compared to Ayutthaya. Its beauty emanates from its well-preserved temples, as well as the landscaping that has been done within this seemingly compact park (e.g., healthy ponds, trees along the roads, effective singages, etc). Highlights for me include Wat Saphan Hin, the temple on a hill which I had to arduously climb twice since I forgot something on top; Wat Si Sawai, the most obvious exponent of Khmer architecture influence; and Wat Phra Phai Luang, where I had the pleasure of enjoying the entire complex all to myself. Perhaps the biggest surprise in visiting this site is the unexpected "ticking off" of Kamphaeng Phet Historical Park, one of the associated towns known for its military and defensive importance, as the bus I took going back to Bangkok passed through this park. Sukhothai ranks as one of the most impressive, and best managed World Heritage Sites I have seen in the region. Bike seems the best way to explore it. Read more from Bernard Joseph Esposo Guerrero here. I visited Sukhothai as a day trip from Bangkok. Bangkok Airways offers 2 daily flights making it easy to fly in, visit and fly out the same day. I paid about USD 100 for the return trip. The morning flight arrives 8:15 am. The airline offers a shuttle bus to and from the historical park (600 Baht return fare). For 30 Baht I rented a bike for the day. I would not recommend visiting the site on foot only. The site itself is beautiful. I have nothing to add to the other reviews. I entered the historical park on 9:25 and the bus left for the airport at 3 pm. This was more than enough time to visit all, including the outlying temples. Like Frederik Dawson I visited all three of the areas included in this WHS. I travelled by bus from Phitsanulok railway station to Sukhothai. From here it was easy to reach the Sukhothai Historical Park, 12 kms away by minibus. From the Sukhothai bus station I found buses heading north which stopped at Si Satchanalai. There were bicycles available for hire on arrival, but I chose to walk the 3 km to the temples. Similarly there were regular bus services heading southwest to Kamphaeng Phet which stopped at both zones of the WHS. I thought the ruins at Kamphaeng Phet to be better preserved than those at the other two locations. But both Si Satchanalai and Kamphaeng Phet were havens of solitude compared with the hordes of visitors at the Sukhothai park. I visited the historical park of Sukhotai in February 2012. The place is amazing. It was the capital of the Sukhotai kingdom during the 13th and 14th centuries. Being given up for centuries, the place has been well renovated by the Thai government. The park consists of almost 200 buildings, more or less in a good state of preservation. Several Buddhist statues are still in place and many temples worth a visit. A good way to go through the park from one place to another is to take a tuk-tuk at the entrance. Sukhotai is one of the best preserved examples of Southeast Asian ancient city and in spite it is far from Bangkok, the place is worth really the travel. Of the three Thai WHS that I visited this was my favourite. It is comparable to Ayutthaya, being a former Thai capital now just a pile of glorious ruins. However the ambience of this site was a little nicer, being set in a park dotted with small ponds and lakes, and there also seemed to be more statuary on display. In fact the very elegant and beautiful Buddha statues that Sukothai is famous for really were the undoubted highlight of the place for me, and every set of ruins had a good example. I used this site as a lunch time stop over on my way between the northern city of Chaing Mai (my personal highlight of Thailand) and Bangkok. It provided a great way to break up the long bus journey, but I think you could perhaps spend an evening there if you wanted to relax and enjoy the site. It is especially good in late November when it becomes one of the best places to see the lanterns of the Loy Krathong celebrations. Sukhothai, Si Satchanalai and Kamphaeng Phet were parts of the Sukhothai kingdom, the first true Thai state in present day Thailand. 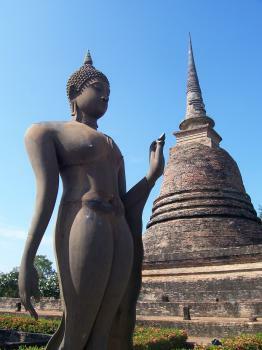 Many Thais considered Sukhothai as their Athens, the golden age of Thai culture and art. Although this kingdom had a short life for just around 150 years, Sukhothai was able to produce art which is considered as one of the most unique and beautiful Buddhist art in Asian history. 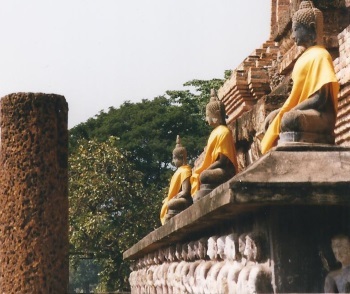 A unique characteristic of Sukhothai art, which is one of the main reason that put Sukhothai in the list of World Heritage, is the unique feminine looked or unisex in the Buddha statues which represented both genders are equally able to achieve the nirvana, the goal of Buddhism. 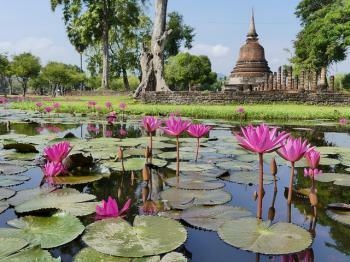 Now Sukhothai is a historical park with many temple ruins and pretty lily ponds that once served as reservoirs for this town. Wat Mahathat, which was a royal chapel in Sukhothai period, is the biggest and most beautiful temple and the ruin is in a very good shape enough to make everyone can imagine its former glory. Wat Sichum with a really big Buddha is my favorite site in all Sukhothai town temples, but my favorite place in Sukhothai era is not in Sukhothai, but in Si Satchanalai, another part of this world heritage site. Si Satchanalai was a very important town in Sukhothai time as most of its rulers were the heir of Sukhothai throne. This town was considered as the second capital and also a great rival of Sukhothai in terms of art and culture developments, even today Si Satchanalai pottery and goldsmith are still active in production. While Sukhothai historical park is a stylish park, Si Satchanalai historical park is a forest garden with many hidden ruins. Although Si Satchanalai ruins are smaller and not impressive as in Sukhothai, I really enjoyed Si Satchanalai with its undiscovered charm, cycling in this historical park made me feel liked an explorer in Asian forest. Wat Nang Phaya, a true jewel of Si Satchanalai, a small and hardly notice temple ruins is my favorite as this temple is the only place that can preserved its ancient decorative motifs in a very good condition, a really beautiful art inspired by flowers and trees. Kamphaeng Phet is quite different from Sukhothai or Si Satchanalai in terms of art and surrounding. Kamphaeng Phet means Diamond wall or unbreakable wall, a very good name for the town which was located on a military strategy point and had a great record of war history. 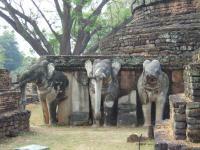 The historical park is in a very dry forest, a very contrast to the greenness of Si Satchanalai. The art of Kamphaeng Phet also looked very masculine and was mainly built from red rough laterite making a striking contrast to the famous Sukhothai. The ruins are also smaller and in bad conditions (maybe the result of the war destruction) I have to admit that Kamphaeng Phet is quite disappointing, but when my friend and I discovered that we were the only group of tourist in this historical park, we finally found some place in Thailand where no tourist at all and this was quite impressive for us. Sukhothai - Si Satchanalai - Kamphaeng Phet is the must for everyone who wants to understand Southeast Asian history and the birth of Thai nation. There are many things to see in these three historical parks. The only strange is if you want to see the most beautiful Sukhothai style Buddha and the symbol of all Sukhothai art as Thai people claimed, you have to go to the modern town of Pitsanulok to see the wonderful 750 years old Chinarat Buddha in Wat Yai, a really beautiful Buddha statue with golden halo! 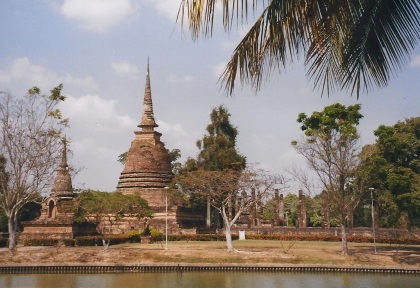 A real crown jewel of Sukhothai period, but is not in world heritage list! Fusion: "The great civilization which evolved in the kingdom of Sukhothai was a tributary of numerous influences and ancient local traditions, but the rapid assimilation of all these elements forged, in record time, what is known as the Sukhothai style."